About 5.7 billion euros ($6.5 billion) may be added to Germany's planned military budget from 2020, in line with a proposal by the country's Finance Minister Olaf Scholz, according to Reuters. The planned boost comes in addition to a 323-million-euro ($368 million) increase in the German defense budget in 2019 to purchase more sophisticated vessels and fighter jets in the next few years. In particular, the extra funding is expected to be spent on an advanced heavy-lift helicopter, new Eurofighter Typhoon warplanes and the MKS180 multi-role warship. The financial boost, which is reportedly part of Germany's 290-page list of proposed budget revisions, is due to be discussed by Germany's legislature later this week. It is still unclear how the additional funding would affect the military budget's share of the country's gross domestic product (GDP). 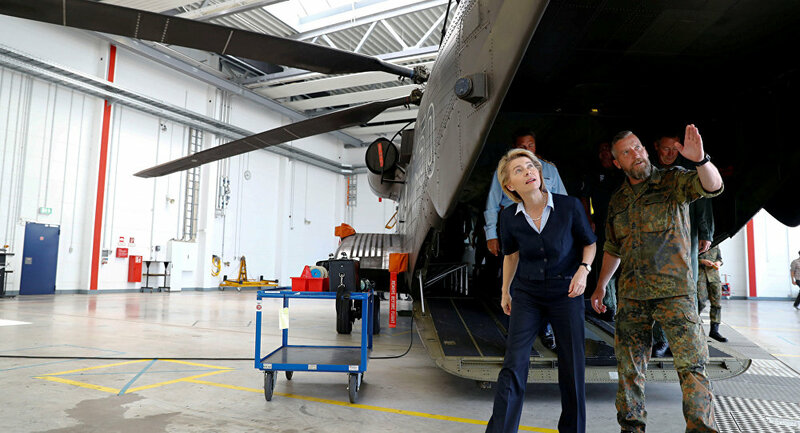 In June, the German newspaper Bild reported that Defense Minister Ursula von der Leyen had ordered a 12 billion euro ($14.6 billion) boost in the country's defense budget of 39 billion euros ($47.3 billion). In April, the Bundeswehr announced plans to allocate more than 450 million euros ($546 million) to the modernization of its armed forces in 2018. The move came amid reports that the German army has been suffering equipment and staff shortages, specifically related to its Tornado combat jets, the A400M transport aircraft and the Leopard 2 main battle tanks, which are in a poor and "outdated" state. Also, none of the German navy’s six submarines were operational at the end of 2017, and just nine of a planned 15 frigates are in service, according to a report by the country's parliamentary watchdog. The reports additionally cited a serious shortage of personnel in the German army, with 21,000 junior officer and NCO (non-commission officer) positions currently unfilled. Berlin has kept defense spending at just 1.2 percent of its GDP in recent years. However, in March, von der Leyen announced that the country would increase the defense budget to 1.5 percent of GDP by 2025. It is still half a percent below the 2 percent requirement NATO members agreed to in 2014, something that has repeatedly been criticized by US President Donald Trump.